First developed by Apple-IBM-Motorola alliance, PowerPC is an instruction set architecture (ISA) widely used in embedded and high-end computing applications. PowerPC is particularly suited for rugged industrial applications which have to endure extreme temperature ranges while integrating high volume data originating in multiple sensors. What was the customer challenge? Currently, Engine manufacturers monitor the engine data and perform engine health management by themselves. A pioneer engine manufacturer of aerospace industry wanted to change this and give its ecosystem partners like airlines and primes, access to engine data for them to perform engine health management independently. The client wanted to develop this solution on an open platform like Android but its PowerPC based hardware didn’t support Android. PowerPC, being a big endian architecture, does not support open source platform like Android because android supports little endian architecture. 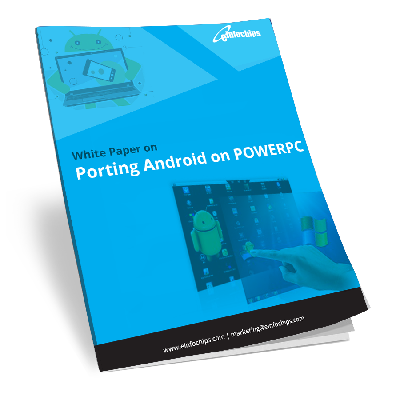 In this whitepaper you will get to know how eInfochips overcome this challenge and successfully ported Android on PowerPC. Why is Android Porting on PowerPC a major achievement? Need for toolchain modification for PowerPC architecture. No toolchain for PowerPC available. How eInfochips solved this problem? The only solution was to address above challenges for the very first time. eInfochips initially worked on Android version 4.4.4 porting with Dalvik in portable mode. The only available toolchain path was hardcoded in scripts. To support PowerPC configuration, all scripts had to be modified to support PowerPC. Further details have been explained in the white paper.